So, Dr. Dayan Jayatilleka has committed a cardinal sin by colour-washing the embassy and his official residence without the consent from Colombo. 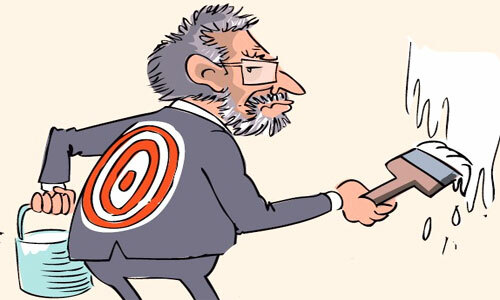 The move by the External Affairs Ministry to call for explanation from the Sri Lankan ambassador to Paris on such trivialities, has painted the government authority in the deepest shade of black, which no amount of whitewashing by the powers-that-be can clean off. According to the press reports, the External Affairs Ministry’s overseas administration division Acting Director General Mr. W.G.S. Prasanna has sent a five-page show-cause letter to Dr. Jayatilleka highlighting the charges regarding his conduct and a few alleged wrong doings. Colourwashing the embassy building and the official residence prior to a visit of External Minister G.L. Peiris and providing interim accommodation for a first secretary until a suitable place of residence was found, were the three allegations directed at him. One of the few career diplomats who knows well the four corners of the world, Dr. Jayatilleka, unlike many, does not have a history of discrepancies. Perhaps, his clean record may have been one among many things that was found intolerable by those who now attempt to run him over with petty charges. As a mature government that understands the importance of an efficient diplomatic mission, it should not give into the whims, fancies and devilish personal notions of those who operate it. When the country is still hurting from the wounds of Geneva, a battle which was lost mainly due to diplomatic ill-handling, Sri Lanka cannot afford to commit any more grave errors in the face of escalating international pressure. If the government’s high heads are born with an iota of pragmatism, they should be supporting the Sri Lankan diplomats who serve the country, rather than pulling the carpet from underneath their feet. Dr. Jayatilleka does not need testimonials. The diplomatic battle he fought in Geneva in 2009, earning an almost impossible victory for the island nation, speaks for himself. However, his prize for winning was a call back before the end of his term. Hence, the government should be grateful for the fact that he continues to stand by the Sri Lankan diplomatic mission, despite the blatant sidelining he was compelled to endure. In an era when the diplomutts with inside connections are growing in numbers and career diplomats are fast becoming an extinct species, the government should be mindful of the fact that it was because of a few like Dr. Jayatilleka that Sri Lanka could stand tall on international platforms. Probably, the indigestive truth behind such senseless action is that unlike many who lack foresight, Dr. Jayatilleka has been too wise to approvingly nod at every incongruity committed by the powers-that-be. What the government should be doing right now is remedying the post and pre-geneva muddles, without throwing those who saved the country, into the pit. It is high time the decision-makers let go of their bruised egos and come to terms with the fact that no amount of training, luxuries or experience can create another Dayan Jayatilake. He might not lose much in the face of a callback, but for the country, it is a lot more than a pre-mature end-of-term of another diplomat. After all, he was not caught with a gem-studded bathtub in his residence!